If you're looking for a last-minute, easy-breezy Halloween costume, may I recommend my favorite Snapchat filter?? 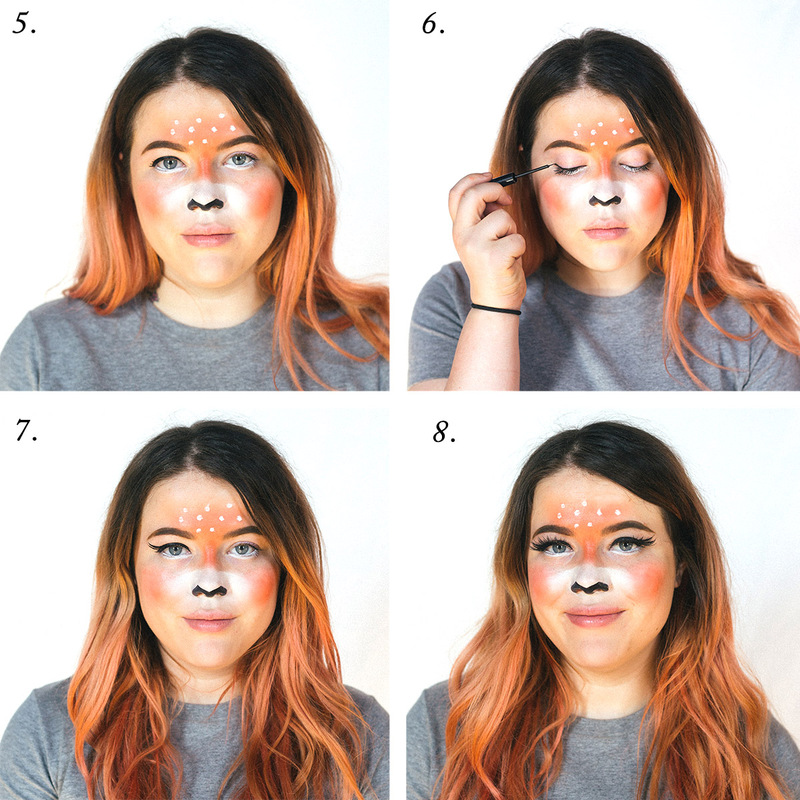 Step 1: Apply orange face paint on the lower portion of your forehead and the top bridge of your nose. If you don't have the orange paint, you could use a matte bronzer as well. 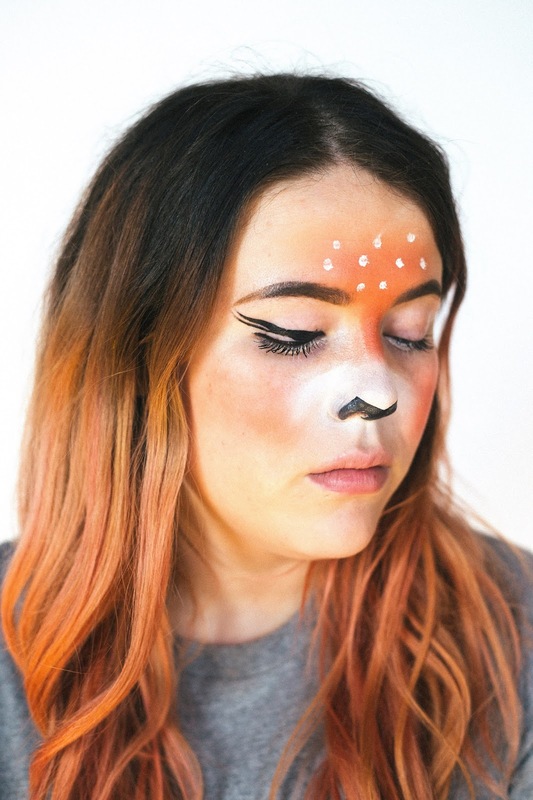 Below the orange portion, apply white face paint all over your nose and on the sides of your cheeks in the shape of a snout. Step 2: Color in the tip of the nose, making a "V" shape on the front. You can use a liquid eyeliner to outline the area you will fill in with black face paint — this will make the tip of the nose more likely to stay on and less likely to smudge. Both good things! 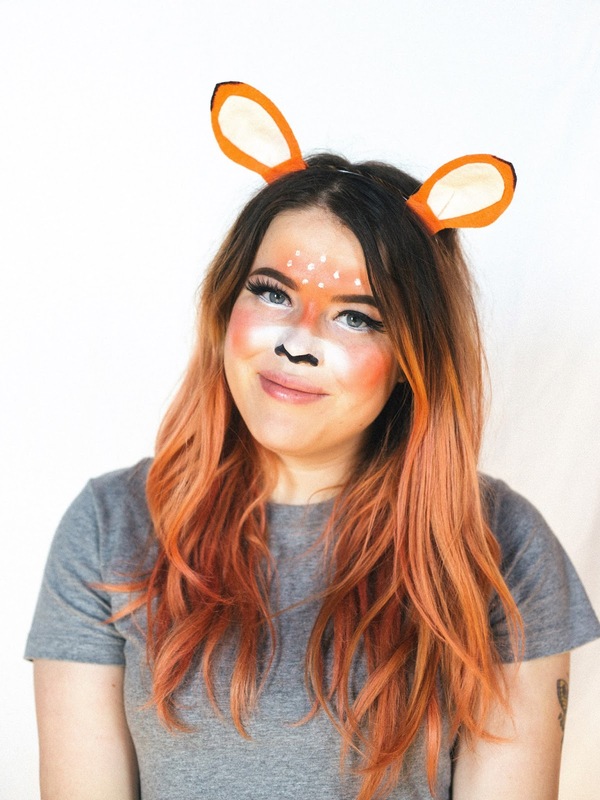 Step 3: Using the end of any eyeshadow brush, dip it in white face paint and apply to the forehead above the orange. This will help you get even dots that are the same shape. 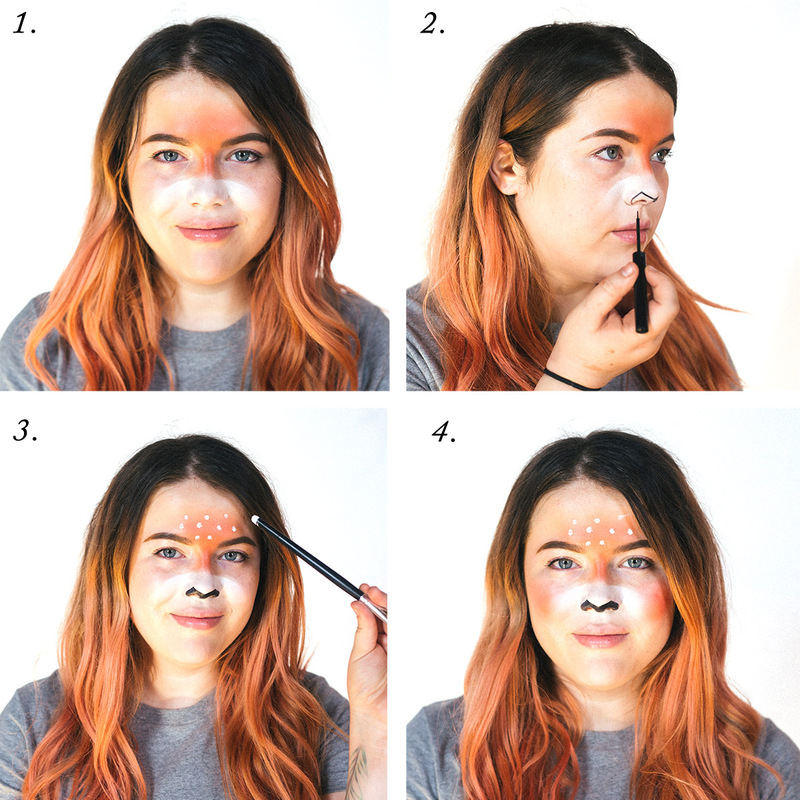 Step 4: Apply the orange face paint in round circles on cheeks. If you think about the first time you ever applied blush when you were about 13, that's the shape you're going for here. Step 5: Apply white eyeliner to your waterline and below the eye to mimic the larger-than-life eyes on the Snapchat filter. Steps 6-7: Apply eyeliner directly above lashes, and create two wings going up toward the brow with a liquid liner. This is the trickiest part, so we'll share a close-up below. Step 8: Apply false lashes, and you're good to go! This part can be left off if you choose, but it makes the eyes look even bigger! This eyeliner look is to mimic the Snapchat filter, but you could just create one large wing if you wanted, and people would still get the i-dear. 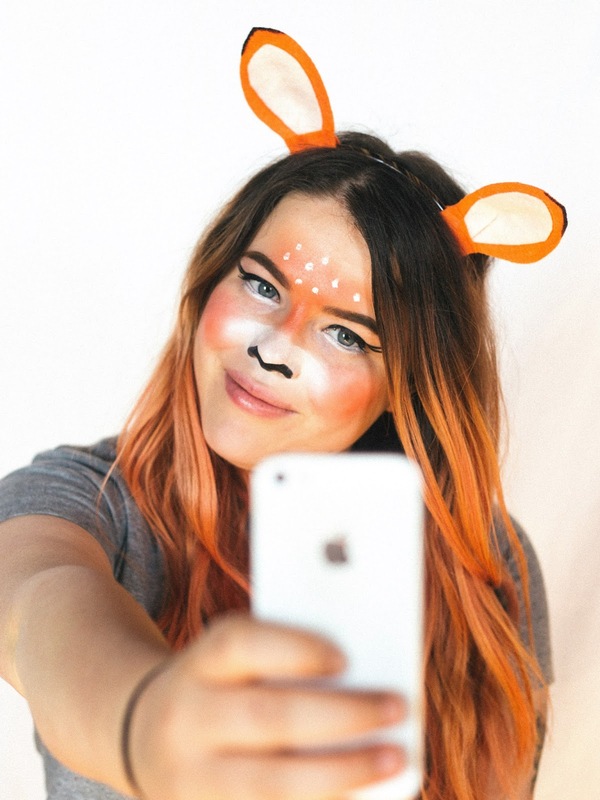 Don't forget to snap all your friends when you're wearing your cute costume! What are you going to be for Halloween?! This is such a cute idea! You did an amazing job on the makeup! Wow, girlie, this is such a great pictorial! I love how you showed everything step-by-step! Thanks so much for sharing and I hope you're having the best week so far! Oh wow! This looks so ON POINT. You're amazingly talented! The eyeliner part does look extra tricky. You nailed it, though. Awesome tutorial! The knee-high gladiator sandals can help in making your legs appear longer. You just need to be careful in choosing the kinds with the straps that will look good on the shape of your feet. Instances of these items are lipstick,angelina jolie skin care make-up lip gleam and hostile to maturing cream. These are probably the best items you should observe for you to accomplish beauty in any capacity. Without the extravagant fashion proclamation,Song Hye Kyo Anti Aging Products one can depict beauty by doing the trick the impression of other individuals.